LocateMe - Free open source GPS tracking software for MIDP 2.0 mobile phones. This small (30-35K) application requires a mobile phone with an integrated GPS or a separate Bluetooth GPS and will show you the direction to a given location (a "target") without maps, using a pulsing direction arrow. You can request the location of other LocateMe users by text message, send your own location, or just simply save a location for directions back to it later. * Saves your GPS and target settings between runs. * Complete integrated GPS support (some features may not be available depending on phone GPS capability). * Sats button is now "Satellites"
* The application is not security signed (this costs money! ), so you will be shown numerous security popups when you start it. * As your phone is not a compass the direction target arrow will only point to the correct direction once you start walking, and the phone can determine which way relative to North you are going, i.e. when you are stood still your phone doesn't know which direction you are facing! :) On startup, until the GPS gets an accurate fix, the direction arrow to the target will not be shown. This software has been tested on Nokia Series 40 3rd edition phones at a minimum resolution of 128x128 pixels and Sun WTK emulator at 240x320. 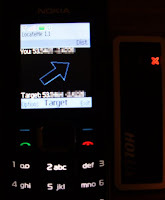 It has also been successfully tested on a Nokia N95 and Nokia 6650 with integrated GPS'. The software is licenced under the modified for UK Law CPL 1.0 licence which is included with the distributions. If you have an integrated GPS in your phone remove the lapi.jar (location API) from your netbeans project - you don't need it as the API is built-in to the phone already. On phones without GPS the lapi.jar file provides utility classes for location manipulation which are ordinarily not available. To use lapi.jar on such phones you will need to obfuscate the lapi.jar when you compile your project or you will not be permitted to compile/install the app since the lapi.jar file has packages in the default Java namespace ("java.location" if I remember) and this is banned according to the Java specification. This will be the problem you have seen. Obfucating the code scrambles the jar so the namespace changes to something like "a.b" which is not recognised as being in the Java namespace. Hope this helps.